Nine people namely P, Q, R, S, T, U, V, W, X prefer different Banks viz. BOI, BOM, SBI, UBI, Central bank of India, Indian bank, Dena Bank, Canara bank, and PNB. Each one has a sweet box of different colors among Black, Brown, white and grey sit around circular table facing away from the center. At least two but not more than 3 people preferring Bank have box of same color. The following information is known about them. U and S have same color box. R sits 2nd to the right of Q. X sits exactly between U and T. P prefers SBI and has black colored box. The persons who have black colored box have one of the neighbors who has grey box. W sits 3rd to the right of P. X sits 3rd to the right of Q. two people who prefer any of the banks Canara bank, BOI, Dena bank and BOM are not sitting together with the exception of one pair. R sits 3rd to the left of T, who prefers Dena bank. X has the sweet box which is not packed in Grey colored box. Q and W have white colored box but P doesn’t has White colored box, also Q, P and W prefer SBI, CBI and PNB not necessarily in the same order. S and Q sit together and they prefer CBI and BOM nut they don’t sit with P. T sits with one of the persons who has Grey box. The person who prefer UBI and PNB are sitting together. The person who prefers BOI got brown box and sits second to the left of the one who prefers Indian Bank. S got sweets in brown box. 1. Who sits second to the left of the one who prefers Indian bank? 2. Who prefer Canara Bank? 3. X prefers which bank and got which colored box? 4. 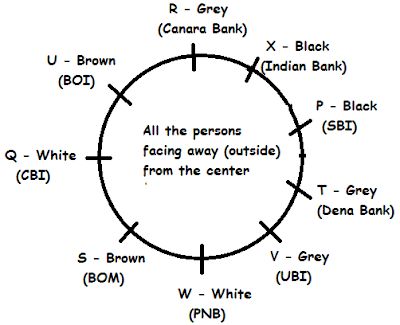 How many persons are there between the one who prefer UBI and U when counted in clockwise direction? 5. Who are the immediate neighbors of W? B had a prime numbered rank. The sum of J and B's rank is equal to D's rank. E's rank is a multiple of A's rank. C and H are immediate neibhours. Only one persons sits between B and J, who is not an immediate neibhour of A.
H has an odd numbered rank. I secured 3 ranks better than H.
C has a rank better than F. Also, C secured better rank than E but not by more than four ranks. 6. Who among the following are standing at the 2 corners? 7. How many students will be standing between C and E in the photograph? 8. What is the position of B with respect to D? 10. 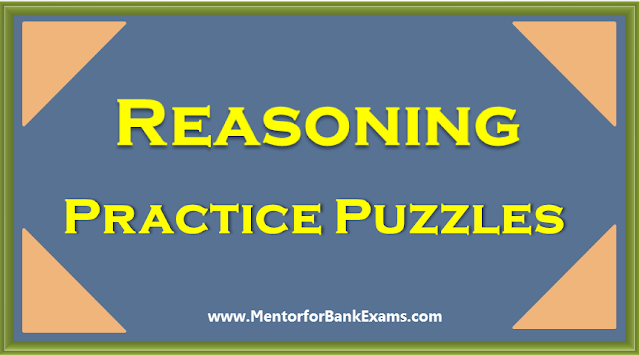 In which of the following groups is the third person standing exactly in between the first and the second person?